Download Hour1 Download Hour2 Schooling and the ideology of life as machine. 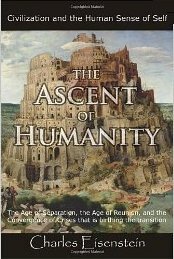 Last week I said we'd finish the series of readings from Charles Eisenstein's Ascent of Humanity. Well, it turns out not quite right, because I couldn't make everything fit into the exact one hour and fifty nine minutes this show to occupies. In the age of reunion, radio shows will get to be whatever length they need to be, and not have to conform to a predetermined clock. Everything we do is subject, even in subtle ways to the machine ideology of mass production and nothing more so than the system of schooling, which figures prominently in Eisenstein's book, and will be the topic of two interviews in the first hour. The full integration of the pain from the life of separation is what impels us back toward wholeness. One way or another, the pain will be felt. We can either wait for it to come to us, like an addict determined to get a fix at any cost, or we can go to it. Perhaps if we can see the futility of control, the futility of perpetually postponing the consequences, then we will have the courage to face them. It is said that no addict truly enters recovery until he or she hits bottom; however, it is equally true that "bottom" is different from person to person. At some point the addict decides no longer to evade the pain of a shattered life, wrecked family, sick body, or ruined career. He feels the accumulated agony, mourns what is lost, tries to make amends. Sometimes he succeeds in doing so before all is lost, before all friendship, all wealth, all health has been converted into money for the fix. Perhaps we humans will do so as well, and begin making amends to the world we are ruining before all beauty, all goodness, all wealth, all life is consumed. This page was last modified on 2 November 2013, at 02:08.